Their lives were centuries apart. Their spirit was one and the same. Desmond De Leon grows up in the outskirts of 1980s San Francisco, avoiding gangs, dodging bullets and caring nothing about the petty politics of his troubled part of town. He's far too fascinated with the bloodier and bolder history of San Francisco newspaper journalism based downtown. Once the epicenter of American journalism, it's where the infamous newspaper tycoon Charles Sansome died with pistol in hand during an era when editorial disputes were resolved within 20 paces. As the headstrong, scrappy kid rises from San Francisco Call copy boy to reporter, he documents the deteriorating character and morals of his journalist mentors, along with the decline of the newspaper itself. Walking the same ghostly streets as his 19th-century newspaper tycoon heroes once did, and with a dash of supernatural guidance, Desi's search to find out what Call founder Charles Sansome would do leads him from the highest avenues of society and politics to the back alleys of the Mission District in this hip, funny, romantic and ultimately tragic near roman clef written by the one who lived it. Delfin Vigil wrote his first newspaper story in the sixth grade. Immediately after graduating from high school in 1993, he was hired as a copy boy at a time when it was still okay to call assistants copy boys. 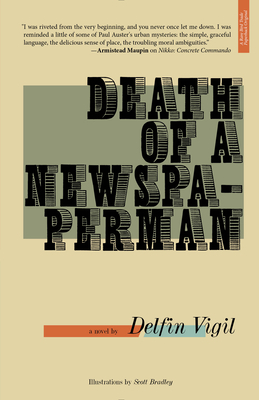 Delfin spent most of his career as a general assignment news reporter and bylined staff features writer for the San Francisco Chronicle. Delfin's most recent published work is the nonfiction story of Nikko: Concrete Commando (The Rumpus, 2010). A collaboration with artist Paul Madonna, this story follows the life of an elusive sidewalk graffiti artist from the 1960s. The Nikko story has been featured on NPR and has received praise from writers such as Armistead Maupin, Stephen Elliott, and Tony DuShane. Delfin is also the lead singer for Three Ring Records' Amores Vigilantes. His band receives consistent college and Internet radio play across North America, Europe, and Japan. In 2013, his band collaborated with Bay Area Hip Hop legend Lyrics Born on a 12" single that was shortlisted for a Grammy nomination. Illustrator Scott Bradley's drawings have been featured in everything from comic books to scientific journals with stops in newspapers and 'zines along the way. He is currently working on a graphic novel titled "The Sound," based on his experiences touring the country playing in bands. See scott-bradley.deviantart.com.